Landmarks unanimously voted to protect a five-story building on Bowery, a Canal Street theater, and an East Village church. On September 7, 2010, Landmarks designated three Manhattan buildings as individual City landmarks. Landmarks unanimously approved a five-story cast-iron building at 97 Bowery, the terra cotta-adorned Loew’s Canal Street Theatre, and the Gothic-Revival style Eleventh Street Methodist Episcopal Chapel. The Lower East Side’s 97 Bowery Building was built in 1869 to house a carriage-supply business and hardware store at a time when the Bowery was a major commercial thoroughfare. Architect Peter Tostevin designed the five-story structure featuring a three-bayed cast-iron facade with arched windows framed by Corinthian columns. Prior to 1961, the building’s third window bay of each floor was filled in to accommodate an elevator shaft. A visible, one-story rooftop addition was also added to house the elevator machinery. Vice Chair Pablo Vengoechea pointed out that designation would increase the possibility of creating a building restoration plan. Commissioner Margery Perlmutter noted that cast-iron architecture was rare along the Bowery and that its isolation lent the building a special quality. Loew’s Canal Street Theatre at 31 Canal Street was built in 1927 by prominent theater designer Thomas Lamb. When Lamb built the theater, the Lower East Side had the country’s highest density of people and movie houses. The majority of theaters from this period have been demolished or have undergone extensive renovations, but the Loew’s theater remains intact. The theater’s ornate terra cotta facade features garlands, sea serpents, and griffins. At a June 22 hearing, Thomas Sung, the building’s owner, testified that although he had originally intended to redevelop the site, Landmarks staff had convinced him of the value of preserving the structure. 7 City- Land 94 (July 15, 2010). 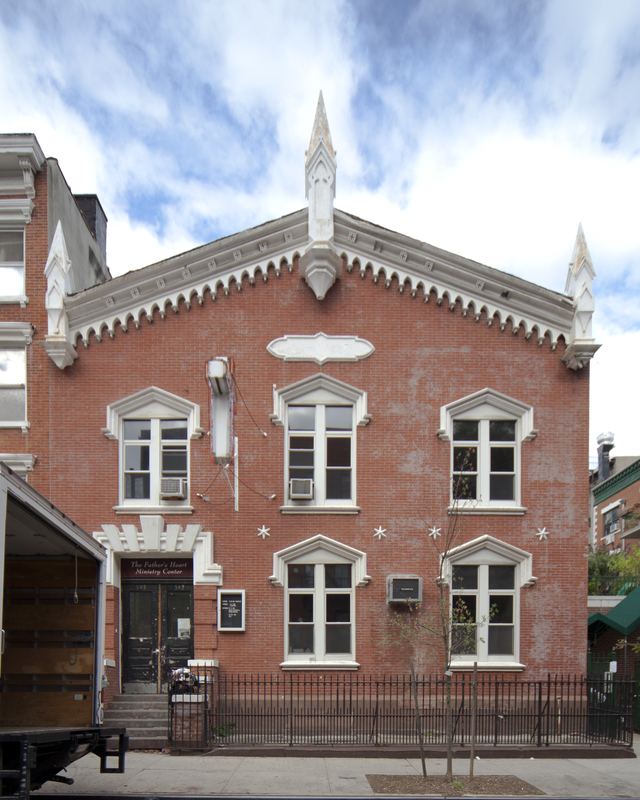 The Eleventh Street Methodist Episcopal Chapel, at 545 East 11th Street in the East Village, was designed by the architectural firm of William Field & Son in 1868. In 1900, architect Louis Jallade and Joel Barber renovated the Gothic-Revival facade, adding a Colonial-Revival style entrance way. The two-story, red brick building was originally used as a chapel, a meeting room, a Sunday school, and as a dispensary for the area’s immigrant population. In 1941, the building was sold to a Slavic Pentecostal congregation, and is now known as the Father’s Heart Church. Chair Tierney noted that Landmarks’ staff identified the “remarkable church” as part of the agency’s extensive and on-going East Village survey. Commissioner Bland noted that the church’s red brick and white wood cornice recalled the Carpenter Gothic architectural style and made it “highly worthy” of designation. LPC: 97 Bowery Building, 97 Bowery, Manhattan (LP-2353); Loew’s Canal Street Theatre, 31 Canal St., Manhattan (LP-2368); Eleventh Street Methodist Episcopal Chapel, 545 E. 11th St., Manhattan (LP-2398) (Sept. 14, 2010).